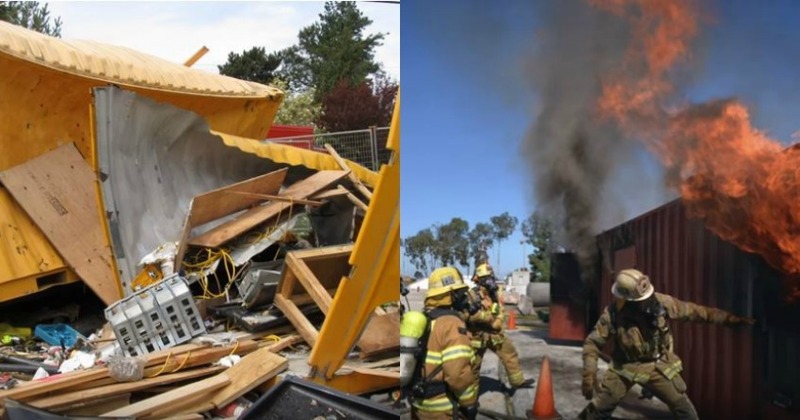 Im pretty sure you dudes have been asked to enter shipping containers as part of your STCW training but are they SAFE ? Where is the written and documented risk assessment ? What are the emergency procedures for staff and course participants in the event of ANY incident involving injury or POSSIBLE injury to somebody ? Do you have correct levels of tested, functional and and fit for purpose protective clothing and equipment ? Are there professionally fitted, tested and maintained gas detection alarm systems to alert you to a leak of gas within the container and surrounding structures ? Are there mechanical ventilation systems to vent leaking gas to a safe environment ? Can you smell LPG ? Not wearing breathing apparatus ! Can you hear a gas leak - refer to above ! Should LPG cylinders be stored inside a structure next to a steel shipping container which is getting heated and conducting heat to its external surfaces ? Should you actually be igniting gas inside a container with no third party control of the system in place utilising detection. alarm and ventilation systems to allow for detection of gas at the earliest opportunity to allow for a shutdown, evacuation and ventilation before BOOM happens ? Don`t forget your free drinks vouchers though you beautiful people ! Gas inside a shipping container ? Surely not allowed as this would fly in the face of not only gas safety legislation worldwide but also the most basic level of competency and common sense. Are you seriously telling me that people are grouped inside a steel container, a flow of gas is released into a unit and ignited? What if there was a small, undetected leak or a sudden catastrophic equipment failure ? What about an accumulation of unburnt LPG due to inadequate airflow suddenly igniting ? The effects would be instantaneously explosive and destructive with almost certainly fatalities. Gas fired training units need a whole raft of primary and secondary safety features installed to detect, alert, control and ventilate at a pre-determined gas concentration below the lower explosive limit. Do the manufacturers know about this and have the local fire department inspected the facility and installation of the gas burning appliance. The possible consequences do not bear thinking about and the guilty parties would more than likely be looking at hefty custodial sentences for gross negligent manslaughter charges. This beggars belief Roland Ged. Have you done anything about this ? Any students asked to take part in such a dangerous practice should think twice - quickly and seriously.